Though Ingmar Bergman made The Magician at the peak of his career—a year after The Seventh Seal and Wild Strawberries, and just before The Virgin Spring and his “God’s silence” trilogy (Through A Glass Darkly, Winter Light, The Silence), the film tends not to get the same attention as those surrounding it, perhaps because it lacks the buoyancy of his comedies and the severity of his dramas. But it occupies a wonderful place between those extremes, staging the would-be unmasking of a traveling magicians’ troupe as part serious inquiry on science and the ineffable, part bawdy bedroom farce. It’s haunting and beautiful at times, surprisingly playful at others, and like all great movies about magic, it has more than a few tricks up its sleeve. More than an hour passes before Max von Sydow, the eponymous conjurer, even speaks a word, but his eyes—and Gunnar Fischer’s exquisite black-and-white cinematography—communicate all that is necessary about a man who works to sustain a practiced air of mystery. As word of von Sydow’s dangerous act proceeds him into the next town, the local authorities refuse to let his carriage pass, and he and his three assistants are brought into a nearby estate for interrogation. But von Sydow’s muteness is part of the act, as is the identity of his wife (Ingrid Thulin), his various health-promoting magnets and elixirs, and a show that includes levitation and an “invisible chain.” On the question of whether science can explain everything, Bergman remains noncommittal, but as a master illusionist himself, his sympathies extend wholly to von Sydow’s band of rogues and the productive chaos their one-night visit creates. 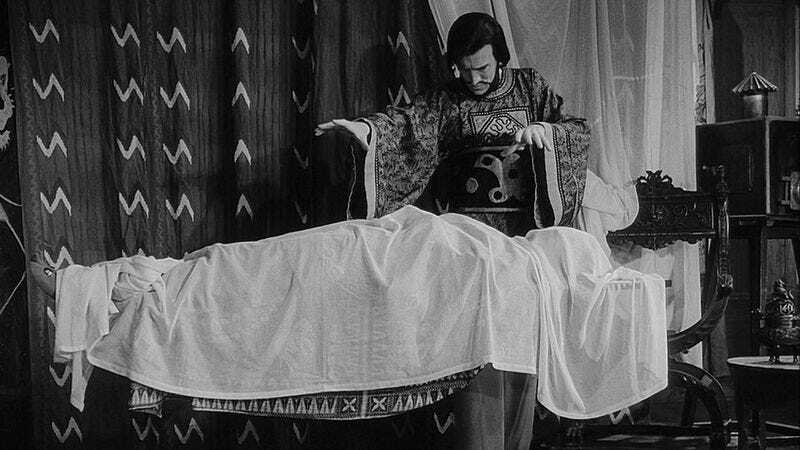 In The Magician, flim-flammery is the spice of life. Availability: Criterion issued a gorgeous DVD and Blu-ray just two years ago, and the film is included among the company’s Hulu subscription offerings.